The next function under the Home menu option is Company. This page allows the merchant to view and edit details pertaining to his or her company and merchant accounts. On the top of the page there is a button which leads to the Chargeback Response System edit page. 11. EIN (The Employer Identification Number or Tax ID for the merchant company). The Merchant Accounts grid provides info about the different merchant accounts assigned to the company. Some of the merchant account details can be updated via the Edit link. Accounts in Test and Development statuses are marked with yellow color. Accounts for which payment processing is denied for mobile application are marked with triangle icon in the first column of the grid. 1. Merchant Account Name. The Merchant Account Name is the arbitrary merchant account name created by the user on setup. 2. In the next column the merchant will see is titled Payment Type. In this column the merchant can see the type of payment. 3. In the next column the merchant will see is titled Creation Time. In this column the merchant is able to view the date each account was created. 4. Next column is Time zone. In this column merchant will get the time details of the specific payment. 5. Next column is Status. It is the status of the account selected in the 'Integration Mode' field. It can be Live, Test or Development. 6. In the final column next to each row there is both an Edit and Delete link. a. Clicking Delete will remove the account from the merchant’s company account. In reality the account can only be deleted if it has never processed a transaction. Accounts that have processed and are deleted are actually set to Archived and the data is retained for up to 5 years. Archived accounts are no longer viewable online. b. Clicking Edit icon allows the merchant to edit the connection details of the account. iii. The Banking details shown on this page cannot be edited by the users of the gateway. Changes to this information must be done by gateway support. In this fashion, funds cannot be inappropriately diverted to or drawn from the wrong account. Note: Under the title banking the merchant can view the banking information pertaining to and involved with the merchant’s company. 6. Bank Account Type. The options are Checking or Savings. This account is used to pay the automated ACH fees due for gateway services. It’s important to note, the account information entered here has no effect on settlement deposits. Those are maintained at the merchant account level with the processor and cannot be changed by gateway users. 7. ACH Account Type. The options are Personal or Business. If user selects Integration Mode = 'Live' then transactions processed through this account will be sent to the processors and merchant will be charged for such operations. If user selects Integration Mode = 'Test' then transactions processed through this account will not be sent to the processors and merchant will not be charged for such operations. If user selects Integration Mode = 'Development' then transactions processed through this account will be sent to the processors with test credentials and merchant will be allowed to use test credit cards for this account. The service with settlements runs every half an hour. 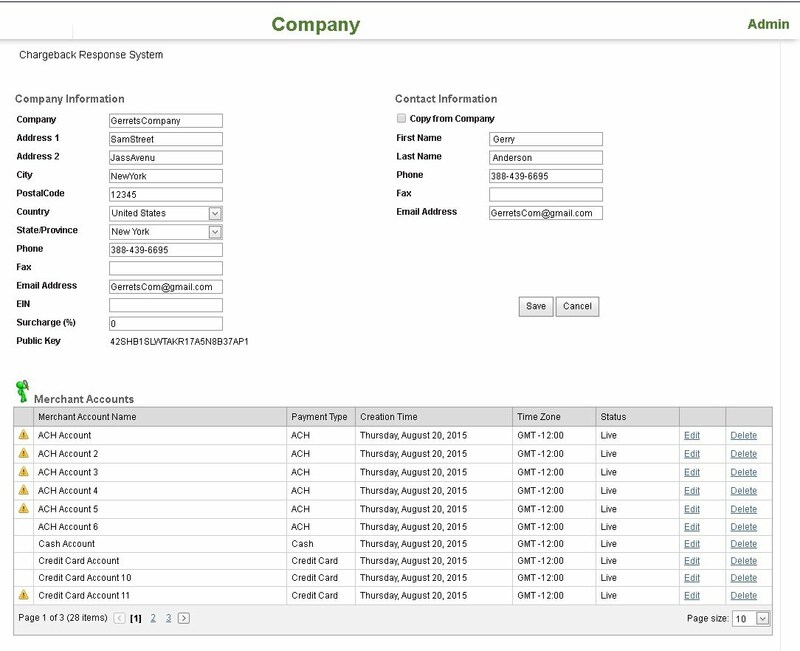 User is able to set Custom Settlement Schedule for each account. Otherwise transactions for this account will be settled every night by default. Step 1: Select the correct Time Zone. Step 2: Select the checkbox 'Custom Settlement Schedule'. 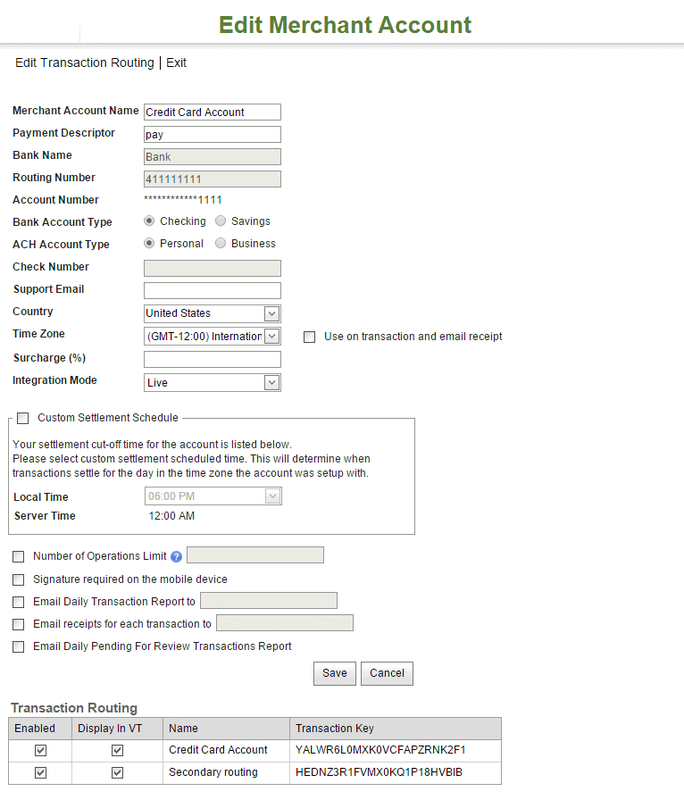 Step 3: Select 'Local Time' according to the time when you want to process settlements for the current account.